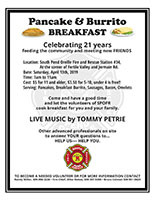 The annual Pancake & Burrito Breakfast celebrating 21 years of feeding the community and meting new friends was held on Saturday, April 13 at South Pend oreille Fire and Rescue Station 34, which is located at the corner of Fertile Valley Road and Jermain Road. Live music was by provided by Tommy Petrie. Advanced professionals were on site to answer questions in order to HELP US...HELP YOU. To become a needed voluteer or for more information contact Randy Miller, Bruce Colman, or Fire Chief Mike Nokes at 509-447-5305. The Weather-Ready Nation Ambassador™ initiative is the National Oceanic and Atmospheric Administration’s (NOAA) effort to formally recognize NOAA partners who are improving the nation’s readiness, responsiveness, and overall resilience against extreme weather, water, and climate events. As a WRN Ambassador, South Pend Oreille Fire and Rescue is commited to working with NOAA and other Ambassadors to strengthen national resilience against extreme weather. In effect, the WRN Ambassador initiative helps unify the efforts across government, non-profits, academia, and private industry toward making the nation more ready, responsive, and resilient against extreme environmental hazards. Weather-Ready Nation (WRN) is a strategic outcome where society’s response should be equal to the risk from all extreme weather, water, and climate hazards.